It took days for the rest of our things to arrive and I would watch every day for the Railway Express truck to arrive. Categories: houses, Martha's Vineyard, Massachusetts, Memories, New Jersey, New York, Newark, NJ, Oak Bluffs, Photographs, summer, trains, travel | Permalink. My parents and I always left the day after Labor Day, we sailed from Oak Bluffs, and usually on the Nobska. Back in the 1950’s my parents and I traveled to and from Martha’s Vineyard by train… the New York, New Haven and Hartford railroad’s Cape Codder went from Pennsylvania Station in NYC right to Woods Hole… or vice versa at the end of the summer. The train stopped at what is now the staging area for cars waiting to get onto the ferries. The tracks ran under the overpass in the left corner of the photograph below. It was literally only steps from boat to train. 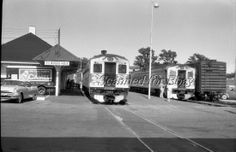 Train service ended in the 1960’s. I loved riding on the train, still do. The trip to NYC took about 5 hours and then we arrived in Pennsylvania Station in NYC. But we weren’t done with our train travels yet, we still had to take a train from Pennsylvania Station in New York to Pennsylvania Station in Newark, New Jersey. From there I think we took a taxi home. We traveled light on our way home, I would have my favorite doll, Beverly, and my teddy bear with me and my parents would have a small suitcase with a few belongings in it, the rest of the things… like ALL my toys we sent to and from the Vineyard by Railway Express. It took days for the rest of our things to arrive home and I would watch every day for the Railway Express truck to arrive. It was bittersweet seeing that truck as I was happy to have my toys and things back but it also meant the official end of summer for me. Categories: architecture, boats, Martha's Vineyard, Memories, New York, Photographs, summer, trains, travel | Permalink. I was in New York City and visited Grand Central Station, mostly to take photos of this magnificently restored building. I thought I had never been there before…but in looking around something clicked in my brain ! When my mother and I would go to MV every summer we would take a train from Pennsylvania Station in Newark, NJ to, as it turns out, Grand Central Station in NYC where we would change trains. 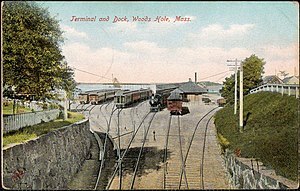 We would have to run from one end of the station to the other to board the New York/New Haven & Hartford’s train on the Old Colony line called the Day Cape Codder, which would take us all the way from New York City to Woods Hole, MA. That’s right, all the way to Woods Hole. The train stopped at what is now the staging area for cars waiting to get onto the ferries. The tracks ran under the overpass in the left corner of this photograph. It was literally only steps from train to boat. A comfortable and luxurious way to travel in the days when lots of people didn’t have cars and the road system left a lot to be desired anyway. 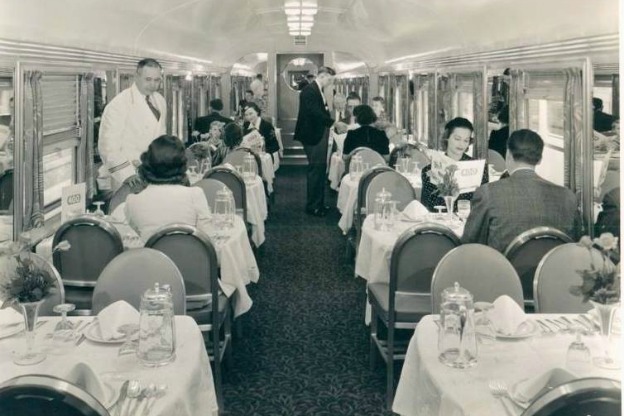 The trains had dining cars with each table dressed in fancy tablecloths and crisply ironed napkins. The waiters and conductors were always the same and seemed to remember me from year to year… made me feel special and grown up. 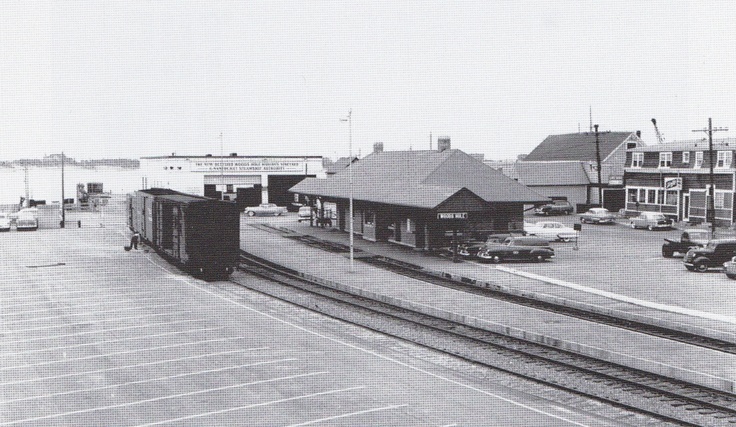 Train service to Woods Hole ended in the 1960′s. We’d land here in Oak Bluffs and our relatives would be there to greet us, and three glorious months on the Vineyard would begin. Well it turns out I was wrong !!!! I don’t like being wrong, even worse I don’t like admitting it… but I have to set the record straight because I know at least one person who did these trips as well and he’ll spot the mistake. Recently I was watching the PBS program The American Experience about the ‘The Rise and Fall of Penn Station’ and I realized it wasn’t Grand Central Station we had taken the train to Woods Hole from…. it was Penn Station !! 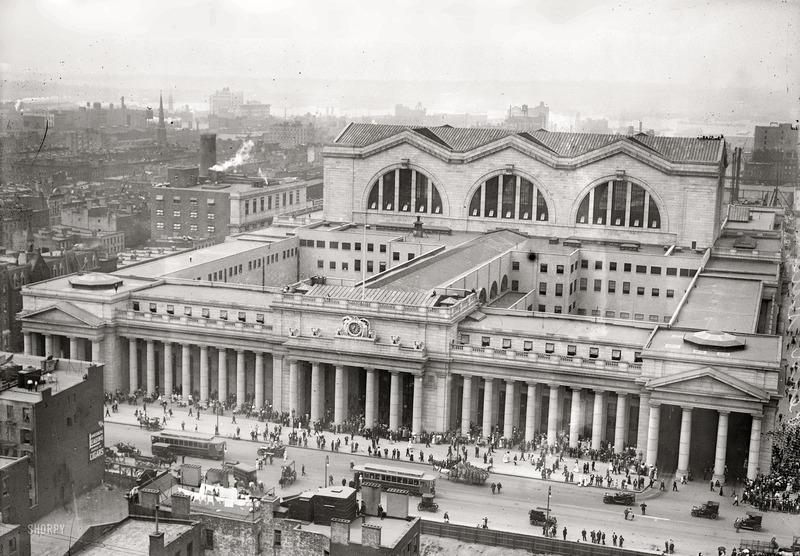 Pennsylvania Station was built in 1910, covered nearly 8 acres, extended 2 city blocks and was one of the largest public spaces in the world. Its 3 year demolition began in October 1963. It was replace with another Penn Station which Madison Sq Garden sits atop. The person I mentioned above is my life long friend Will Jones. His parents Bill and Bertha owned the bowling alley in Oak Bluffs which was across from the Flying Horses. … to my house where we freed his mother’s forks of their yarn. I have no recollection of what we did with the yarn flowers. Will and I spent every day of the summer together. We went swimming, rode the Flying Horses, read, drove our parents crazy and were inseparable. For many years his parents owned a bowling alley in Oak Bluffs across from the Flying Horses. Long before automation the pins had to be set by hand, I even did it from time to time myself. Categories: architecture, Martha's Vineyard, Memories, New Jersey, New York, Oak Bluffs, Photographs, trains, travel | Permalink.